These styles are my interpretation of classic designs. Slightly smaller than the OM style, this is amazingly comfortable to play and typically has a wonderful balanced voice. Mahogany, flamed maple, or figured walnut topped with Adirondack spruce are my favorite combinations employing the24.75” scale with rosewood fretboard and bridge. Always a good choice, comfortable to hold while sitting on the couch. 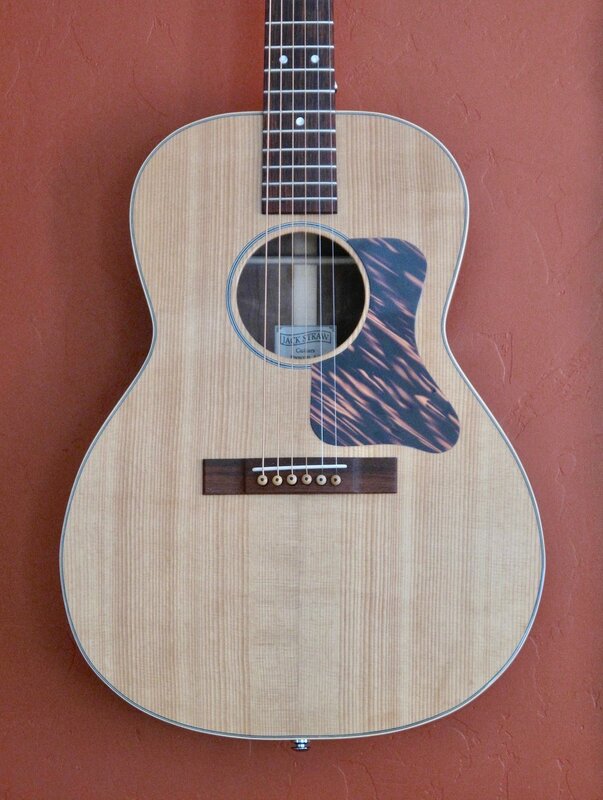 The OM is a traditional favorite of fingerstyle players. Any wood combination works well. Flamed maple with Adirondack is my favorite with the traditional 25.4” scale using an ebony pyramid bridge and fretboard. Think of the J-45 or Advanced Jumbo. This is a great all-around choice if you prefer a little more bass and like larger bodies. Works well with either short or long scale. My favorite is the traditional combination of Mahogany topped with Adirondack using the short scale with rosewood for the bridge and fretboard. This is a very special style. 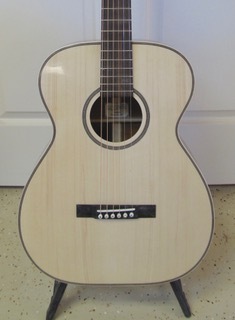 OM body with a 12 fret 24.9” scale neck. Altered bracing pattern to accommodate a pyramid bridge placed closer to the center of the most active part of the soundboard. Very strong bass with fat treble response. Fingerstyle players go nuts over this one. Any back and side woods topped with Adirondack make a great guitar. 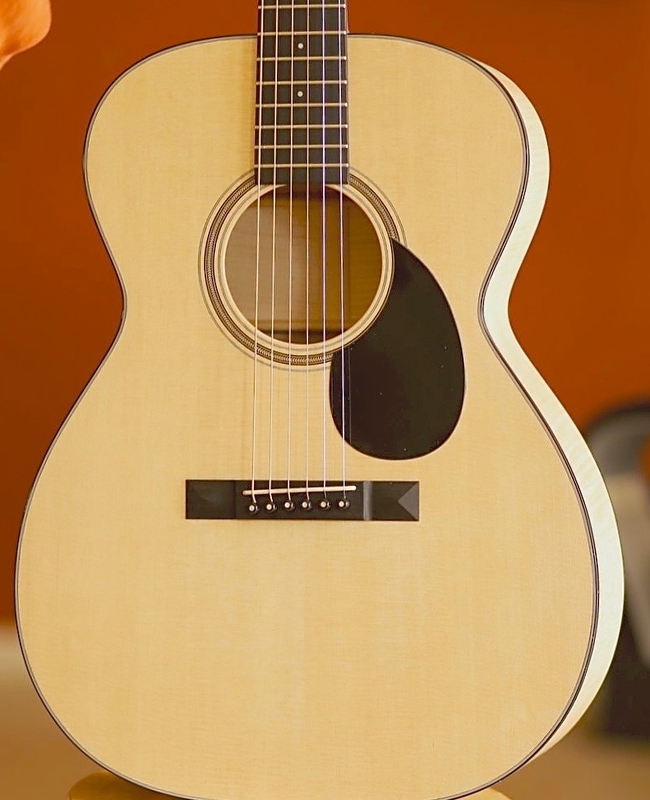 The 12 fret 000 is a very graceful shape. Generally supplied with a wide neck, slotted headstock, 24.9” scale and small pyramid bridge. Always a superior choice for finger style. My favorite is the all mahogany model. Note, pictured instrument is a 12 string….yes, really. Neck width, string spacing, fretboard radius, and fret size/material are done to client specs. Pick-ups are client choice items but my recommendation is the JJB Electronics 330. Please don’t ask me to cut a hole in the side for a control panel. Completion time depends entirely on my work load. I do everything myself. I have no helpers. 12 to 16 weeks is usually the minimum time needed.